Congratulations to our Grand Prize Winner, "Michelle L.", and our runners-up, "Linda H." and "Christine K.". Thank you to all the authors and to all the great readers participating in the giveaway! 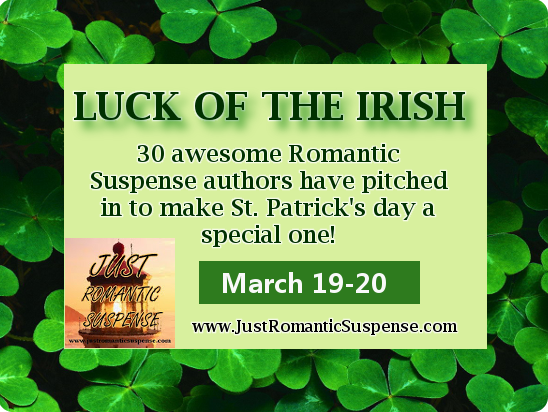 From March 19-20 everyone has an opportunity to experience the LUCK OF THE IRISH on JUST ROMANTIC SUSPENSE! Thirty of your favorite Romantic Suspense authors have pitched in with their print or digital books to make your St. Patrick's Day a special one. On March 21st, one grand prize winner will be able to select 10 titles of their choice from the Pot Of Gold. Please note the author's individual restrictions. My dog has a favotite green frog toy! Thanks so much for this draw on a great selection of authors. My favorite "green" thing especially on March 17th... Green Beer and Green Eggs & Ham!!! Thank you guys so much for this opportunity! My favorite green item has to be my daughter's prayer room. It has the most beautiful shade of green on the walls while the trim is white. The accents are pink. There are a pair of comfortable gliders in there, a bookcase (love those books), and some lovely art work on the walls. Thanks for the giveaway! My favorite green thing, my football team Green Bay Packers. My August birthstone is peridot, so one of my favorite green things is a birthstone ring my husband bought me many years ago. Hi! My favourite green things are the green grass and green leaves of spring! It lets us know that the warmer weather is on its way! I love spring...so I guess my favorite green would be the green of spring. Thanks for the chance! My blanket is green! I'm cuddled under it right now! The green grass of spring! My fave "green" item is a jade necklace that a friend gave me as a gift. My cat has green eyes. My husband's eyes look green only a few times a year, so they're a rare treat! My favorite green is my pot of shamrocks! I'm not a fan of green so I will say my green bamboo plant. It actually survived the tornado here but it's still not quite back to normal again. Adopted Christmas Cactus that blooms all year long... oh and $100 bills. My favorite green thing has to be the green case I have for my kindle! My favorite green thing isn't all green, but he does wear green. Marvin the Martian and his dog K-9! Thank you for the awesome St. Patrick's Day giveaway! :) ~ Wherever you go and whatever you do, may the luck of the Irish be there with you. Sláinte! Oops . . . was supposed to say my favorite green is the little crocus tips poking up through the snow in early spring. Thank you for the awesome St. Patrick's Day giveaway! :) ~ Wherever you go and whatever you do, may the luck of the Irish be there with you. Sláinte! My new Green Lucky Snoopy shirt. Oh, emeralds, emeralds, emeralds! An emerald is such a lovely green thing! Sprouts! Yes you heard it right....I love sprouts �� Lol great giveaway! My favourite green thing is a sweater I got as a gift. It's been perfect this winter because it's really warm and has a big turtle neck. I love vegetables, but that would be too easy. :D My favourite green item would probably be the apple green pillow I bought earlier this year. Best purchase of 2016 so far. Right now my favorite green item would be the green shirt I bought for my daughter's trip to Ireland. She is there now on an exchange program at a camp for visually impaired students! A jade necklace from my parents. My favorite green is the grass after a good rain. Everything is so clean then. I like green. I have A LOT of green things. I'll have to agree with the others above me that said grass, trees and gardens. Can't wait to grow some herbs this summer.